One word: Awesome. For a sort of modern version of The Lost World, this book is pretty creative. Somewhere in the deep jungles of Brazil, a social anthropologist discovers something extraordinary. 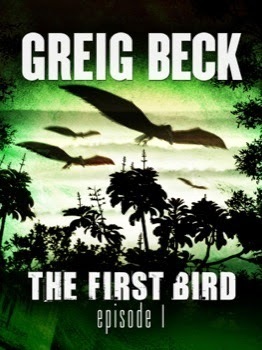 The fame-hungry scientist brings back to LA a live specimen of an Archaeopteryx (the eponymous first bird) and with it, a deadly infection that flays its victims alive. So, while the disease spreads, a team of experts sets out to Gran Chaco to find a cure; a team which includes Professor Matt Kearns, an expert in archaeology, old languages and more out of necessity than choice, adventure. While the plot is kind of formulaic, the world created is entirely original. As with Black Mountain, the thing that really makes this book work is the pace. The plot speeds on and before you even realize it, you're completely hooked. And for someone who manages to keep things moving so quickly, the authors gives a lot of attention to details. Very few authors can describe an intense action packed scene in such a way that you can picture every single move, as if in slow motion. The vivid descriptions make the scenes come to life, making all the bad things ten times more horrific. There are few information dumps, but since this is a thin book (and only the first part in a series), I had to wish there were. Episode 1 is almost just a teaser and ends with that pesky cliffhanger. I can't wait to read the second part. The team is made up of quite a variety of characters, with rather obvious good and bads, so you're bound to find someone to relate to. There's swift, funny dialogue and very cool inputs from the entomologist and the linguist. The native legends, and customs, described mostly by Moema, the local guide of sorts make the whole book very interesting and very real. It also gives you the vaguest idea of what's about to come and how deep the author's capable of digging into a topic. Which is the thing I loved the most: while it's just a novella, it's massive in scope. There is still time to read Episode 1 of The First Bird before Episode 2 comes out in July, followed by the final episode in August. If you like action, adventure, history, fantasy and thrillers, this is an author you don't want to miss. I received this book in exchange for an honest review from the publisher.